The Spain national rugby union team is a national sporting side representing Spain at rugby union. 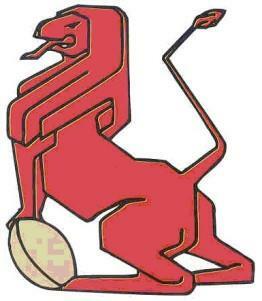 Spain have been playing rugby since the late 1920s, playing their first international against Italy in 1929. They have qualified for one Rugby World Cup, in 1999 where they were pooled with Scotland, South Africa and Uruguay. Spain have also in the past contested the European Nations Cup. Spain plays in red and blue colours. Spain played their first officially recognised match in 1929, winning 9-0 over Italy in the Estadi Olímpic de Montjuïc. Throughout the 1930s the Spanish contested games against other European sides, winning the majority of them, losing only to Germany. The national Spanish rugby team did not participate in any rugby during the 1940s. The Spanish returned in 1951, and throughout the decade found moderate success. Though the side lost regularly to sides such as West Germany. The side found success in the earlier years of the 1960s, though there was a lack of games played during the 1963-5. The latter half of the decade saw the Spanish win most of their fixtures against neighbouring European sides. Spain competed regularly against sides such as Portugal, Romania, Netherlands, Italy, Poland, Morocco and Czechoslovakia. During the early 1980s Spain played Argentina for the first time, as well as consistently playing their old European rivals, New Zealand Māori also played the Spanish in 1982, Spain did however lose the match by over 60 points, and again in 1988, at Seville, losing by a minor margin, 12-22. Spain played the Soviet Union as well as other new opponents during the decade, including Zimbabwe, whom the Spanish played several times during the mid-1980s. In 1994 the Spanish played rugby heavy-weights, Wales, who won by over 50 points. During the mid to late 1990s, Spain completed a nine-game winning streak, winning games against nine different European sides. 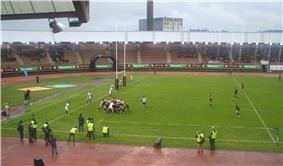 Spain began their quest for 1999 Rugby World Cup qualification in Pool 3 of Round B of the European qualification. They won all four of their games in the round, finishing first in the group above Portugal. They, along with Portugal advanced to the next pool round with Scotland. They finished second and qualified for their first Rugby World Cup. For the 1999 Rugby World Cup, Spain were in Pool A, along with Scotland, South Africa and Uruguay. Their first ever World Cup game was played against Uruguay, with Spain losing 27-15. They lost their subsequent pool games to Scotland and the Springboks by 40 points, both of which were played at Murrayfield. They failed to score a try in the tournament, the only team in the World to have qualified but not scored a try in the World cup. Spain began 2003 Rugby World Cup qualifying games in May 2002. Spain advanced to Round 3 after defeating Portugal. However, here they lost to both Italy and Romania, and moved through to face Russia for a place in the repechage competition. They defeated Tunisia and moved onto face the USA, who won the round and qualified into the World Cup. For the 2007 Rugby World Cup, Spain finished at the top of Pool A or Round 2 of the European qualification and advanced to Round 3 where they went into Pool A. Here they won all four fixtures to finish at the top and advance to the play-off. There they faced Germany, and although they lost the first game, they won the second and went through on a 42-28 aggregate and went into Round 4 where they defeated the Czech Republic to enter Round 5. However they lost out to Romania and Georgia in Pool B, ending their hopes of reaching the World Cup in France. Spain missed the qualification for the 2011 Rugby World Cup in New Zealand. Spain entered the top 20 in the IRB ranking in February 2012 for the first time following a 25-18 win over the higher ranked Georgia, and Spain remained in the top 20 throughout the year, ending 2012 ranked 18th. In 2014 they will participate in the IRB Tbilisi Cup. Spain squad for the November test matches against Chile, Uruguay and Japan. Note: Flags indicate national union for the club/province as defined by the World Rugby. ^ "Georgia to host Tbilisi Cup 2014". International Rugby Board. 4 April 2014. Retrieved 14 May 2014. ^ "Team analysis – Spain – Test matches". ESPN Scrum. Retrieved 17 June 2014.